Four members of the committee that came up with proposed new social studies requirements say the standards are so flawed they can't be fixed. The committee meets Saturday to begin revising the proposed standards. Critics say the first draft is biased, and not age-appropriate for students. Gov. Pawlenty says some of the critics are equally biased. St. Paul, Minn. — A group of 44 teachers, parents and business representatives drafted the list of what students would be required to know about history, geography, government and citizenship. After a series of public hearings and more than 800 comments on a state Web site, the committee is set to begin revising the proposal. Four teachers who serve on the committee have submitted a minority report that calls for scrapping the proposal and starting over. Paul Seeba, who teaches economics and coaches debate in White Bear Lake, says the proposed standards have a right-wing agenda. "You wind up with things like JFK being ignored, Jimmy Carter not being acknowledged, Lyndon Banes Johnson and the Great Society not being acknowledged, and you wind up with Ronald Reagan being mentioned three times," says Seeba. "I think any fair-minded Minnesotan would find that that's an incredible imbalance, and it's simply not good history." Seeba says the proposed standards skip over the decades of the 1960s and '70s, ignoring the Vietnam War and Watergate. Education spokesman Bill Walsh says there are omissions in the proposal, because it's a first draft. "We've heard a lot of testimony about beefing up the counterculture of the '70s, the Vietnam War study," says Walsh. "I suspect the committee will do that, I suspect they'll listen to that testimony, and you'll see it in the second draft, just like we did with math and language arts in the spring." Gov. Pawlenty says some of the standards' critics have a left-wing agenda. He said on MPR's Midday program that the requirements should seek to find middle ground. There are elements within the opposition to these proposed standards that are frightening in my view, in terms of being against American history and ... against patriotism. I'm not saying you use this as a political document, but it has to be fair on both sides. "There are elements within the opposition to these proposed standards that are frightening in my view, in terms of being against American history and ... against patriotism," Pawlenty said. "I'm not saying you use this as a political document, but it has to be fair on both sides." Both Pawlenty and Walsh say they're not surprised the debate over the standards has become political. Walsh says anything that involves what students learn about history and government and citizenship is bound to be contentious. The teachers who signed the minority report say their concerns go beyond content. Mary Tacheny, who teaches elementary school in St. Paul, says the proposed standards are not age-appropriate. She says some requirements for the early grades introduce concepts children can't understand. She listed a couple of them. "Give examples of civilizations of the ancient world and highlights of their culture, such as Egypt and Greece. That's first grade," Tacheny says. "Know how migration and colonization influenced American history. That's first grade." Tacheny and other critics say the committee didn't have enough time to do a thorough job. Education Commissioner Cheri Pierson Yecke has pushed back the deadline for the committee's second draft to mid-December. 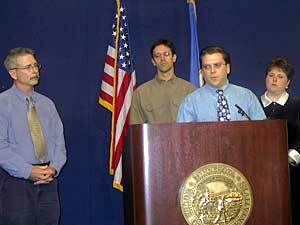 Yecke plans to present a final draft to the 2004 Legislature. Last week, 32 University of Minnesota history professors sent a letter to Yecke expressing concerns over the proposed standards. A coalition of parent organizations plans to hold a news conference before the committee meeting to raise objections to the proposal. Spokesman Walsh says Yecke will present her recommendations for fixing the first draft, but says there's no reason to throw out the proposal and start over.